Of the many rounds that exist today, the .270 Winchester happens to be the one of the most renowned. Hunters are the ones who admire this kind of round the most because of its widespread availability, moderate recoil and terminal ballistic performance. With such capabilities and characteristics of this round, hunters in the United States simply prefer for their hunting experience. And with the country’s diversity hunters usually have different requirements and needs when it comes to using .270 Winchester. For example, hunters in the Texas plains require something with a high level of optical zoom and the capability to perform precise shots. Florida’s brush hunters need something that’s light and has the ability to gather light so that hunting under a canopy is made easily. On the other hand, hunters with dogs require rapid magnification to ensure quick shot placement. Al of these can be easily performed by a .270 Winchester. However, using the best scope for .270 Winchester has the ability to permit the round to control its versatility. Deciding on the best one to pick is also made easier for you this time with our comprehensive review, allowing you to choose according to complexity, precision, durability and cost. BARSKA 6.5-20×50 AO Varmint Target Dot Riflescope. Whether it’s dusk or dawn, those nasty garden pests will never have the chance to stand if you have this varmint scope from Barska. It is something that comes with a design that allows long-range targeting and shooting. It boasts of its 50mm objective lens and multi-coated optics that increase light transmission. With its numerous features, this scope makes an excellent choice for varmint hunting, long-range shooting, precision shooting and target shooting. Bushnell Laser Rangefinder Mil-Dot Reticle Riflescope. If you want a quality optic with stunning high definition clarity then this scope from Bushnell makes a perfect choice for you. This comes with combined laser rangefinder and bullet-drop compensator that will allow you to see your target with stunning clarity, allowing you to nail or shoot it with lethal precision. Its multi-coated optics delivers optimum brightness as well as color fidelity that you can always count on. Its laser rangefinder is powered with a wireless trigger pad and the bullet-drop turrets help in eliminating guesswork. Leupold 113769 VX-R Patrol Fire Dot Illuminated Rifle Scope. This scope from Leupold is an excellent choice for short-range shooting. It combines state of the art illumination with the exclusive Fire Dot Special Purpose Reticle that creates a dependable and versatile scope you will surely love. Featuring unparalleled windage and elevation adjustment travel, this scope simply makes an effective addition to your .270 Winchester’s overall performance. BARSKA 6.5-20×50 AO Varmint Target Dot Riflescope. 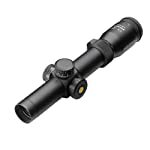 This scope comes with multi-coated optics, one-inch tube and a large adjustable objective lens that allow it to gather light in less than ideal conditions. This makes you feel sure that even when you do your hunting during the darkest of the night, this scope will not allow your targets to escape from your sight. And when you shoot your target with this scope, a high sense of precision is what you will truly achieve. Bushnell Laser Rangefinder Mil-Dot Reticle Riflescope. This scope from Bushnell is loaded with a whole lot of features and characteristics that other scopes in the market may not have. Feature like mil-dot reticle with 30-800 yards range, standard and SCAN modes, fully multi-coated optics, 3.5-inch eye relief and windage and elevation click value .25 are things that will help you achieve a high level of precision on each of your target. Leupold 113769 VX-R Patrol Fire Dot Illuminated Rifle Scope. Tagged as something that performs excellently for short-range shooting, this scope from Leupold features an easily visible Fire Dot that makes low light shooting simpler and easier. It also features windage and elevation adjustments that allow you to see your target no matter where you are. With this scope, you will surely never go wrong as far as precision is concerned. BARSKA 6.5-20×50 AO Varmint Target Dot Riflescope. This versatile scope from Barska with dual adjustable magnification and target dot reticle makes an excellent choice for shooting varmints from a long way off. It is made from highly durable materials, making the entire scope highly resistant to water, shock and fog so you can have something to stay with you for years in all of your shooting and hunting activities. Bushnell Laser Rangefinder Mil-Dot Reticle Riflescope. This imported quality scope is made from 100 percent quality materials that have been tested extensively to ensure maximum durability that you can trust. IT comes with a beautiful design and a sense of durability that’s made to last. It also has the ability to withstand water and fog. Leupold 113769 VX-R Patrol Fire Dot Illuminated Rifle Scope. This scope from Leupold is made from polymer and aluminum and of imported quality. It also boasts of its Diamond Coat lenses that give you the ultimate reliability on abrasion resistance and light transmission that you can always depend on. Truly, this is something that you can count on as far as durability is concerned. BARSKA 6.5-20×50 AO Varmint Target Dot Riflescope. When it comes to buying things, price is one of the things that really matters the most. If you are on a tight budget and you want something to enhance the performance of your .270 Winchester without spending much for it then this scope from Barska makes an affordable pick for you. It’s a scope that’s priced at below seventy bucks so that’s an affordable price for a quality scope. Bushnell Laser Rangefinder Mil-Dot Reticle Riflescope. This scope comes with a price that’s less than four hundred bucks. If you want to spend a little more with a high quality scope for your .270 Winchester round then this makes a good choice for you. Leupold 113769 VX-R Patrol Fire Dot Illuminated Rifle Scope. With a price that’s less than five hundred and ten bucks, this scope from Leupold happens to be the most expensive among our three best scopes for .270 Winchester. If you want something quality and you are willing to scrape off a little more from your wallet, this makes a good choice for you. When it comes to durability and cost, BARSKA 6.5-20×50 AO Varmint Target Dot Riflescope scored higher than our two other scopes from Bushnell and Leupold. However, this does not necessarily mean that Bushnell and Leupold scopes are not good for you because they also performed well in the game in terms of complexity and precision respectively. In other words, any of these three works best for your shooting needs specifically when you make use of your ever loyal .270 Winchester.